Let us learn to let go…. Living in such a way that we are so dependant on God that the Wildness of His leading is but a knowing that we have just learned to mount the wind like we were riding a Wild Stallion. so that you can BE FREE, and WILD and full of JOY. Just like watching a child running like a wild animal through the yard, full of laughter and excitement. Let’s Ride the WIND and SOAR! I love that quote!!! 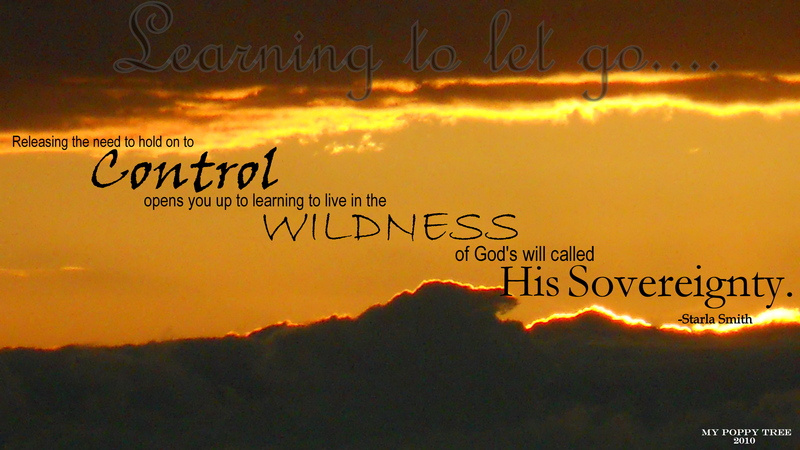 My take-away: I release my control and live in God’s Will. Thank you. He has been teaching me to LET GO…. We are so dependent on our ablity to TRUST HIM! I make it so conplicated with all the ME ME ME and I I I’s that I leave out the Be still and Know that He is GOD!